Details on 24 monitor demigods—such as primal inevitables; protean lords; psychopomp ushers; and the mysterious aeon known as Monad, the Condition of All—and the divine powers they bestow upon mortal worshippers! Rules for the proctor prestige class, along with information about different monitor sects, mantras for summoning monitors, and esoteric occult rituals that harness the power of monitor divinities. 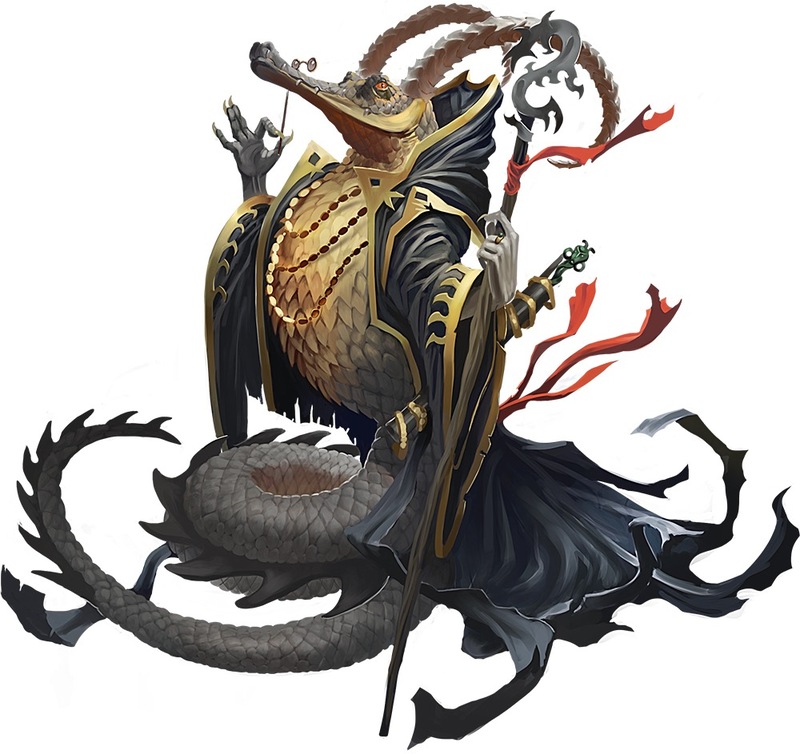 A bestiary of new monitors and their roles within the universe, including irresponsible illureshi protean sorcerers, morbai psychopomp masters of healing and poisons, and knowledge-erasing agnoia aeons! 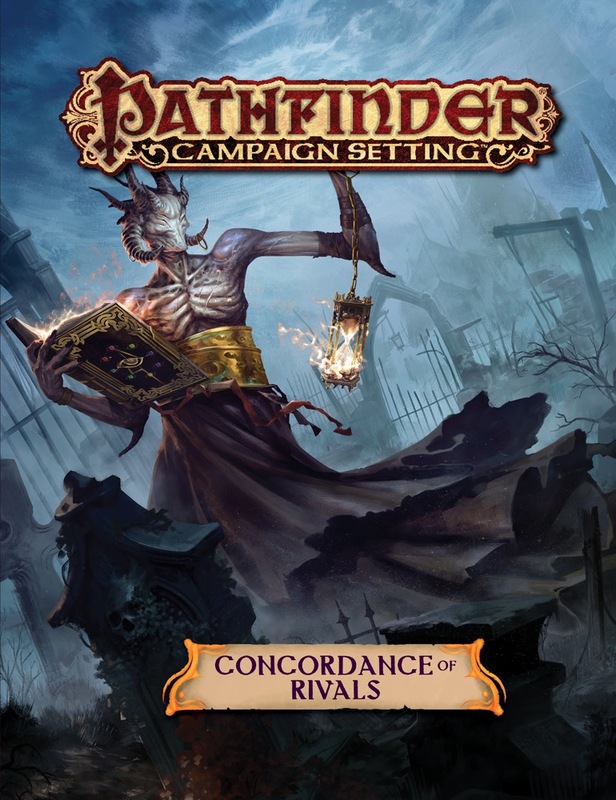 Pathfinder Campaign Setting: Concordance of Rivals is intended for use with the Pathfinder campaign setting, but it can be easily adapted to any fantasy world. I'm actually kinda surprised, but Primal Inevitables are now my favourite type of monitor lords. Machine gods have always been appealing to me, but reason I got into them was how as demigods of absolute law and order their areas of concerns are really mundane and structured. Like for example, one of missing ones was demigod of calendars. My current ranking of monitor demigods is primal inevitabls > monad = psychopomp ushers > protean lords. Issue I have with proteans in general that as random shapeshifitng chaos beasts, they are ALL snakes with two legs, though third of the new introduced bestiary proteans finally strikes my fancy as while they still have serpentine shape, they are way more chaotic and weird looking than majority of other proteans. In general, all of new bestiary monsters are great, flavorful and weird :D Only two of the proteans, while cool that they fill lower cr roles, seem kinda standard to me, rest of them are wonderfully weird to me. I think thats good way to summarize this book, its wonderfully weird. All of monitor demigods are some of the most interesting neutral aligned deities in the whole game. 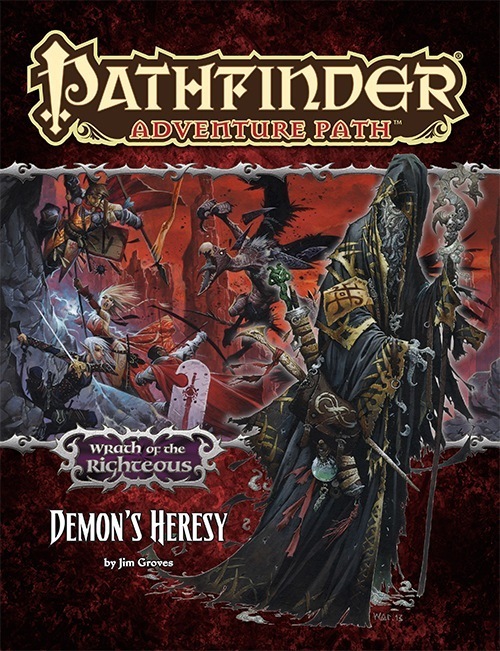 It's a format Paizo has some experience with by now- the three volumes of the Book of the Damned, then the hardcover, the Chronicle of the Righteous- all the fingerprints of those books are on this one- but it's a more refined product than those earlier ones, benefiting from both greater experience- and more oddball subject matter. The "monitors" (Monitor is to neutral outsider as Celestial is to good and Fiend is to evil) get codified a bit, and there, of course, some new faces, but the real meat of this sucker is in the various neutral-aligned Monitor demigod writeups. Full disclosure: I'm a sucker for Psychopomps, so I found their Ushers the most engaging, but just about every category has something cool to run with. Lust for Gold? Power? Or were you just born with a heart full of neutrality? Zapp: I hate these filthy Neutrals, Kif. With enemies you know where they stand but with Neutrals, who knows? It sickens me. I have been waiting for this book be published for years now, and it finally arrived on my door step. The largest part of the book is dedicated to exploring the various demigods that by and by cause reality in the pathfinder world to function (ensuring that gravity works and that atoms spin) and so far I have enjoyed this section. Much love was poured into making each of these leaders among psychopomps, proteans, inevitables, and aeons. I found the bestiary very enjoyable and was quite happy to see my beloved harbingers of chaos getting some much needed love and attention by overtaking around half the bestiary all to themselves. My only major gripes rest with the player options section of the book. The proctor prestige class stat-wise seems to be fairly balanced in power to the prestige classes found in the Book of Damned and the Chronicles of the Righteous, I found the class requirement of having to willingly turn down the aid of a celestial or fiend to be circumstantial at best. It seems rather detrimental to deliberately summon a CR10 good or evil outsider just to deliberately refuse it's aid to fulfill a class requirement, as immortals of any alignment can hold grudges lasting far longer than any mortal lifetime. My other gripe with this section was that it did not contain any magical items that were themed for those with a heart the color of freshly poured cement. Particularly the absence of the in-game stats for the Concordance of Rivals artifact. The sister volumes of the works of Tabris have stats in their own books and I thought it a shame that this, one of the final published works for 1E was missing such an iconic detail. I'm sure I could create my own version to reflect the artifacts of the prior books with the power to smite those with extremism in their hearts and spells that reflect a soul tinted by the color of slate, but I still find this absence of the key detail to be a disappointment. All in all, I find the book an enjoyable. There is honestly enough fluff and potential plot hooks in this book to keep me and my players busy as we prepare to continue the epic struggle between good and neutral. Are the morbai psychopomps the same thing as the mor psychopomps mentioned by name in PF47? Ooh, nice! I'd love to hear a little about the prestige class if anybody's got the time, means, and inclination. Thanks! Very excited to get my copy. So four protean lords, monad, four prime invetables... So does that mean there are 15 psychopomp ushers? Or are there other neutral demigods here too? So... You've given us lists of the Primal Inevitables, Monad, & Protean Lords. Could you also do one for the Psychopomp Ushers? Yes, there are 15 psychopomp ushers. Makes sense given Pharasma's cosmic significance. Uncertain, but quite likely. This requires a dev to answer. This feat allows you to get the boons and benefits listed with each demi-gods entry for performing daily rituals. Proctors can be of any spell-casting class and be a minimum of 7th level (based on skill ranks) before proceeding. They need Alertness and Monitor Obedience as feats. They need to have met with a Monitor of the kind of the demi-god they worship and rejected the offer of aid from a somewhat powerful fiend or celestial to become one. They are guaranteed on death of becoming an aeon, inevitable, protean, or psychopomp (based on their god). They exemplify an expression of which group they belong to at 2nd level, with the choices being Executors (usually tied to inevitables), Fosters (usually tied to psychopomps), Harmonizers (usually tied to the Monad), and Impulsives (usually tied to proteans). Each comes with an appropriate manner of behavior/mission and benefit. As they rise in levels they gain abilities and boons based on their god entry and the higher level obedience boons listed there. The abilities of each proctor would be quite unique and very much in tune with the deity they worship. Hmm, come to think about it, I think Shadix Who Dreams is literally only previously mentioned psychopomp usher not explored in this article. I mean not a surprise since they were briefly mentioned in Thrushmoor Terror but still, I can't think of any other psychopomp usher that didn't get included. Protean Lords seem to be the most interesting of the bunch. I think I might have to buy this one. That there was another multiverse and there's going to be a third one after, is there any mention of the Manasaputra? Surviving the destruction of the Multiverse is their whole thing. Haven't seen anything specific yet. Thank you! Those are some tricky flavor prerequisites, but that sounds very cool. I wonder if any of this explains that ominous text about number of incarnation and cycle that infernal contracts on material plane start with ._. that's the sort of "dark knowledge" you can gleam from Those Who Remain (BTW, are those confirmed to be Azathoth, Nyarlathotep and the like?). Alternatively, *some* beings survive from one multiverse to the next, like the aforementioned Manasaputras and their dark counterparts. It would perhaps make Pharasma less "unique", but that could be easily solved by saying it's a "different" sort of surviving - Pharasma survived as herself, while the others have to be "reborn". I really appreciate the monitor obediences being explicitly compatible with Evangelist and the other similar prestige classes. For one, Evangelist is much more compatible with Summoner, and having your demigod send an eidolon is pretty cool. 3/4 BAB & d8 hp? This book is MAGNIFICENT. I feel its last words (and yes there is a Usher for those too) open the way for PF2 not by changing the universe as others have done but by changing how we see it. Someone has loved their reading of Marvel's Earth X and made it theirs. EXCELLENT. Unless I am mistaken, the Monad is the first native creature of this multiverse. happened in the current Multiverse. But is Hell's Asmodeus the same being ? And where might the Seal be ? I'm glad you've enjoyed those sections. Almost mentioned it too because it is also excellent. This book is a true cornucopia of great ideas and clues and hooks and inklings. I was surprised that the Positive and Negative energy planes were almost never mentioned in the excerpts though. One of my favorite things about this book, and equally so about the prior books set around Tabris's in-world writings, is the use of excerpts written by Tabris. It opens up the lingering question of just how much do or even can you trust him, or perhaps trust his sources that fed him information. The use of an unreliable or biased narrator when juxtaposed with the particular elements when Tabris's in-world writing contradicts certain elements of planar prehistory (such as the nature of the Abyss, a pre-existant Maelstrom, the manasaputras, the positive and negative energy planes largely not mentioned, etc)rather than being a problem, just opens up a certain delightful element of mystery that I adore. Oh, good, good. This is excellent. I'm also satified with what the Monad turned out to be, but quite surprised about the Asmodeus and Ihys. Oh, I'm definetly planning to! Just have to figure how to fit everything I wanna get this month in my budget, but this is definetly one of the top spots of the list. Huh, that's curious. Tell me? Does the Prime Material gets destroyed and recreated with each iteration of the Multiverse, or only the Outer and Inner Planes get renewed, while the Material itself remains? Complete hard drive wipe. Assuming if that’s true that is. I'm sure it was all true when he wrote it. It's just that what's objectively 'true' has a disconcerting habit of changing, depending on the current value of the reality constant. Awesome book! wonderful. Who should we thank for all this NEW stuff??? The writers and the artists. AFAIK, John Compton did Aeons, Inevitables and the in-character bits and Todd Stewart did Proteans and Axiomites. Artists include David Alvarez (cover), Nicolás Espinoza, Sammy Khalid, Gabriela Marchioro, Alyssa McCarthy, and Javier Rodríguez. If a particular piece really grabbed your attention, we can look up who worked on it. Development leads were Eleanor Ferron and Luis Loza. As general advice—and not specifically here, as I know you might not have the book to reference yet—check out the credits pages of all the books you enjoy. The artists, authors, editors, developers, graphic designers, and company put a lot into these, and it’s always exciting to hear when our work’s appreciated (reviews are lovely). And this can help you learn which authors’ work especially excites you, helping point you to other works you might have missed but would otherwise enjoy. that when everything got destroyed the only thing that was left was basically hard vacuum at all spacial locations. What would one day be the physical location of the prime material plane. Basically just big old empty outer space. Forever in all directions. Also Pharasma, the Seal, and Outer Gods (Maybe the Dimension of time, since it has been implied that it IS an outer god). I get the impression that around this localized vacuum the Big Lady P build up the various spheres of existence (inner and outer) and just happened to catch some of those that remain inside it. So basically you get a bubbly of vacuum (prime) surrounded by larger and larger bubbles of new planes. Out side the last bubble (the maelstrom/abyss) you have even more vacuum where more of those that remain live. Which is also basically just the Prime (hard vacuum) again, but with an infinite quintessence bubble of this multiverse floating in it. When this reality eventually ends, it gets exposed to that hardest of vacuums, and pops like a bubble. Edit: Also forgot to add. This is an amazing book, definitely in my top 5. Great job guys. So on less world shattering note (also I need to figure out way to time travel to future just so I can get this book and concentrate again :p ), did this book also come with artifact for Concordance of Rivals so you can now finally collect all three books? Why isn't the Concordance of Rivals given stats? Crystal Frasier, Todd Stewart, Ron Lundeen, and I wrote this book. Kudos to you all. The book will provide inspiration and valuable resources for years to come! So, there might be survivors from previous one(s)? Can anyone share a little bit more detail about the protean lords that got detailed? They are all chaotic neutral (and thus all offer the Chaos domain and of course the Protean subdomain) and they are all genderfluid. I can't tell you any more until I get home and can check my physical book. I finally figured out something that's been poking my brain for a week: the illurishi protean is totally copping this fella's style! At first I'd just recognized the little green staff poking out of the scabbard, but once I made the link I noticed the whole outfit. Okay, the book doesn't actually mention any subdomains. Waaaiiiitttt....there's a demi-god of slang now?!? !